This Easter – Hitch a ride with with the Easter Bunny as he goes on an unforgettable adventure! It’s the biggest Easter egg hunt ever and Benny the Easter Bunny can’t do it alone. He teams up with Wilma the chicken as they hop in a giant hot air balloon and journey to Fairy Tale Valley in search of the most amazing Eater Egg ever; an Easter Egg that can grant any wish one desires! The two adventurers quickly learn that friendly creatures of Fairy Tale Valley are more than willing to help them find the magical egg. But there is a surprise in store for Benny and Wilma: the inhabitants of Fairy Tale Valley love to tell amazing fairy tales, Including such classics as The Hare and the Tortoise, The Lion and the Mouse and many more! 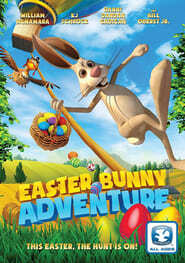 Join Benny and Wilma in an exciting Easter Egg Hunt that kids and parents are sure to enjoy!